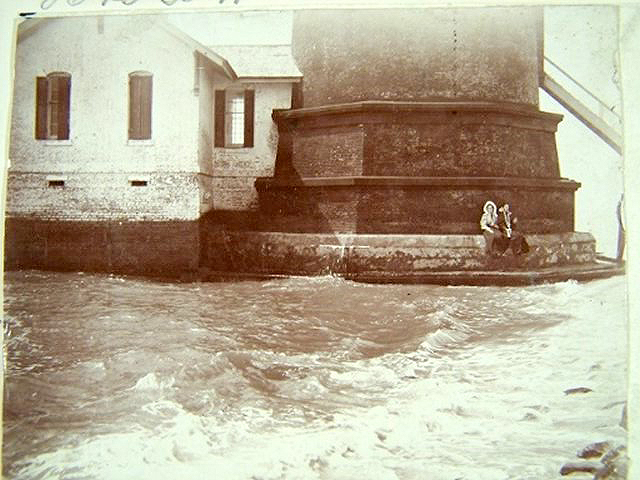 Photo of the Sand Island LightHouse taken sometime around the turn of the century. Archive Editor's note: Upon close eximation, the two individuals pictured are women. They both have long black dresses. The white around the lady's head and shoulders (left) is where the photographer, when producing the print from a glass negative, used a darkroom technique called "dodging". This created a white area around the subject and kept her features from blending into the background. An additional note - the photographer had to be standing on rocks using a tripod for his camera.